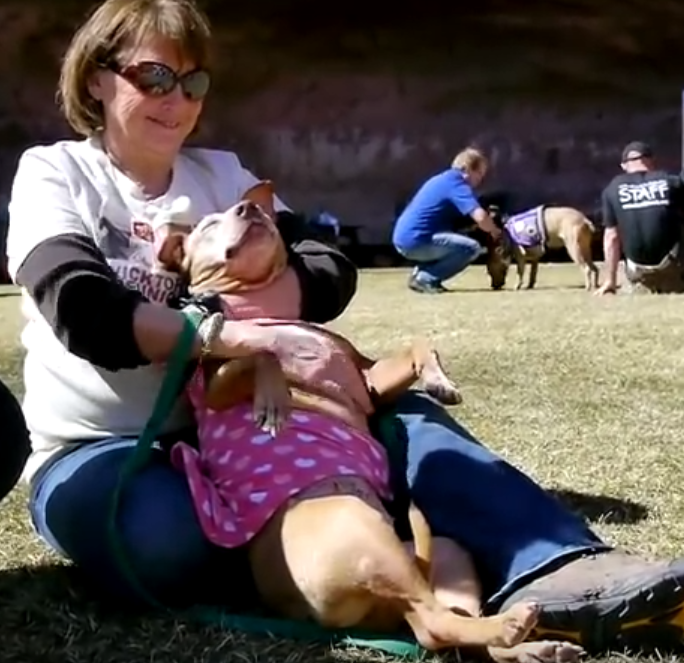 KANAB – Six dogs and their adoptive families converged from all over the United States this weekend for a reunion at Best Friends Animal Society’s sanctuary in Kanab. The attending dogs have gained notoriety as “Vicktory” dogs, coming from a 2007 raid on the Bad Newz Kennels in Surry County, Va. where they had been housed, directed and used for the blood sport of dogfighting. Then NFL Atlanta Falcon’s star quarterback, Michael Vick, and others were federally indicted in 2007, Vick as both the property owner and conspirator in the dogfighting operation. Vick pleaded guilty under a plea agreement in short order and, according to the Humane Society of the United States, paid $1 million for the care and rehabilitation of the dogs. He has since served as a spokesperson advocate against dogfighting for the Humane Society. Best Friends Media Relations Manager Barbara Williamson said that 47 dogs, according to the federal grand master’s count, were taken in the 2007 raid, from which the 22 toughest cases were brought to the Best Friends sanctuary. Best Friends proposed that the dogs could be rehabilitated or, at the least, deserved care and feeding for life. According to Best Friends media release, this was the first time the courts ever allowed dogs confiscated from a fight ring to not only be individually evaluated and rehabilitated, but also to be eligible for adoption. Until then, the protocol for fighting dogs seized was destruction – it was considered that you couldn’t take the fight out of the dog once it was bred or instilled. At a media event Monday, Richard Hunter, a radio talk show host originally out of Dallas, Texas, who discussed the Vick case on air over a period of a couple years before adopting Vicktory dog Mel, said it’s all about the nurture and not the nature of these dogs. There, on the lawn area of Best Friends’ Angels Landing natural amphitheater Monday, pit bulls were in the plenty, surrounded by Best Friends caregivers, adoptive families and no small number of reporters and supporters in a meet and greet of creature-loving hopeful coordinated community. The six adoptive families, representative of 10 Vicktory dog adoptions made thus far, shared stories of their experiences as Vicktory dog owners, or “moms and dads” as they tended to refer to themselves. The group of adopting families has developed into a support community that communicates with each other regularly and continues in dedicated loyalty to the best interest and welfare of the Vicktory dogs and others like them. Vicktory dog Handsome Dan’s new family, the Stoutzenbergers, have established the Handsome Dan’s Rescue for Pitbull Type Dogs in Rhode Island. Mark Stoutzenberger drove 2,600 miles with three dogs in his car to enjoy the reunion, while his wife and daughter flew. With him was Jules, a foster dog from his rescue organization who came along not just for the ride but to be adopted by Vicktory dog Little Red’s “mom,” Susan, bringing Susan’s pack to six. The pit bull breed, which is not actually a breed but a stereotype, Best Friends Director of Animal Care Judah Battista said, is made up of a variety of breeds, Stratfordshire terriers, American bulldogs and others. If you ran a genetics screening on these dogs, he said you’d come up with a list of different breeds in each of them. The stereotype comes from dogs that have been bred to be used as a weapon, he said. But the participants in the Vicktory dog challenge see anything but a weapon in these dogs. Little Red, with fading scars on her hind legs, is believed to have been a bait dog in the Bad Newz operation. Her new “mom” of about a year and a half, Susan, said “Vick tried to make her mean,” smiling as broadly as Little Red who was lolled upside down across her chest baring her belly underneath a pink cape. Little Red was called the happy diva of the gathering. “Little Red didn’t need to be rehabilitated, she needed to recover,” Susan said. The road to recovery for the Vicktory dogs has not come overnight. Hunter described Mel’s psychological issues towards people as something of wariness. The dog’s experience with people before the rescue had been negative and remote, it has taken much careful and patient work to socialize these dogs. Tracie adopted Halle who, she said, today is great with kids; in the beginning, though, Halle was afraid of everything from a guitar to ceiling fans. Paul and Melissa took in Cherry. When they first brought him home Cherry was shy, would sleep with his eyes open and roam about the house at night seemingly only comfortable to do so apart from people, spending days sleeping on a couch. Today, Cherry’s part of the family which includes two cats and a baby boy who freely crawls all over him with no protest from the once shy Vicktory dog. Success stories given Monday were many and reflected efforts of the original Best Friends caregivers, the adoptive families and no small number of animal companions – dogs, cats and even parrots. Best Friends caregiver John Garcia was the first to see the dogs with the initial assessment team. “The best dog trainer in the world is another dog,” Garcia said. The Vicktory owners attested to that. Little Red’s best friend is a 3-pound Pomeranian with three teeth, Susan said. Halle was the first Vicktory dog to be adopted, and Tracie her “mom” said that Tacoma, her other pit bull adopted from Best Friends six months earlier, helped Halle to adjust. The dedicated families of these dogs were enthusiastically determined to show hope and evidence the proposition that the fight is not in the dog, it’s in the people. Their confidence in their dogs was displayed with toddlers and babies snuggling next to them, with good tempered dog-meets-dog encounters and not a single growl to be heard. Still, while this collection of advocates is dedicated to the proposition that fight dogs can be rehabilitated, the nature versus nurture debate is not and likely never will be fully settled. Can you take the “fight” out of the dog? This collection of rescuers aims to show you can. Not all the Vicktory dogs have “arrived” at the point of adoption-ready yet but most are getting there. Of the 22 taken in by Best Friends, 10 have been adopted; three have died essentially of natural causes (one after adoption); two are under court orders to remain in the care of the sanctuary for life, one for aggression issues, one because of his notoriety as the best fighting dog in the Bad Newz organization; and seven are on track towards adoption when deemed ready. The formal presentation Monday ended with one happy Vicktory dog Layla having just passed Best Friends’ Canine Good Citizenship Test, a 10-point prerequisite test dogs must pass before they can be adopted. Williamson said there are very good pit bull rescues across the country. The dogs from the Vicktory rescue that did not come to Best Friends went to some of those, and some were adopted into homes quite quickly. There have been no bad incidents reported with the Vicktory rescues, she said. On adopting any rescue animal, Williamson said what they don’t want is bounce-backs. These Vicktory dogs are a good example, Williamson said, urging that people honestly need to decide if they’re willing to do the work and make a rock solid commitment to the animal even if that animal with challenges never is perfect. 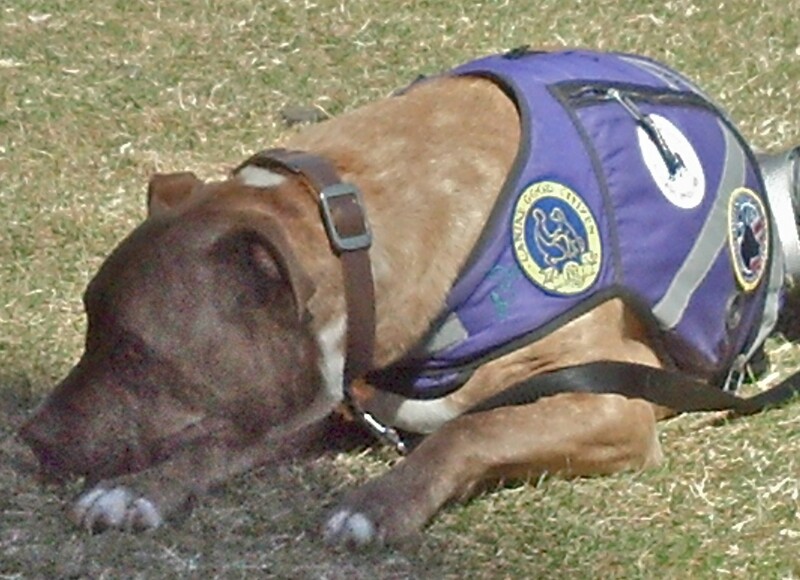 The success of the Vicktory experiment, if one can call it that, has resulted in the Humane Society changing its policy on disposition of fight dogs from destruction to rehabilitation. Since the raid on the kennels, the Humane Society has worked with lawmakers in many states to upgrade scores of laws against animal fighting. One such law currently pending before Utah’s legislature is Senate Bill 52 which upgrades the crime of cockfighting to a felony. SB 52 has passed the senate with a 19-9 favorable vote and moves on to Utah’s House of Representatives. Ed. Note: Due to the national renown of the Vicktory dogs, and for their protection, the Best Friends Animal Society asked that first-names only be used for Vicktory dog owners except in cases where the adoptive owner maintains a public presence. This is truely a great story. All the press that has been generated since Vick was arrested and sentenced has hopefully opened some eyes . People should judge the owners not the breed. Pittys are very gentle pups and only aggresive if they are trained to be so. Dogfighters are just plain ignorant punks that do not have any compassion towards pups in general, and have nothing but disdain toward the human population. They are losers in every sense of the word and should be dealt with severly. 20 years imprisonment for starters. The laws should stiffer and should be upheld. There is absolutely no reason why they should be allowed to walk the streets. And at this point shame on the Humane Society for allowing themselves to be used by Michael Vick. What a wonderful article. God Bless all those dogs and their adopted familes! Thank you to Best Friends and all of the rescue groups that work so hard and give so much of their hearts and finances. pleased to see BEST FRIENDS was able to take these poor animals in and have the chance to rehab them. and human behavior. LOVE & KINDNESS GOES A VERY LONG WAY. Good article — glad to see some of the background attached to a story about the present.